To find the best phones for the hearing impaired we researched over 50 available telephones, read every consumer review and examined the technical details in depth. When it came down to it, we found there are pretty much only two brands of phones worth your consideration; Panasonic and Clarity. Both brands are leaders in phones specifically designed for people who are hard of hearing. Panasonic phones are slightly newer than the Clarity phone so there weren’t as many consumer reviews to take into consideration in our research, but we were very impressed with how the phones are designed and the features they come with. All 6 phones we’ve featured here are cordless. We’ve selected the best High-End Phones for those who are willing to pay a little more for more functionality and top-spec’d phones, best Mid-Range Phones that have both a great selection of features with a lower entry price, and the best Budget Phones which still have great functionality but are perfect for those who want to spend a bit less on a phone. Also be sure to check the end of our article for our pick for Overall Best Phone for 2019. If you’re looking to buy the best telephone available for a hearing impaired person then we’re positive that the Panasonic KX-TGM450S is the best handset for most people. It beats every other phone out there on the technical specifications, and it is also the easiest to use. Which makes it great for seniors who don’t want to spend hours wrestling with technology. It amplifies speech to a whopping 50 db (the highest out of all available phones for hard of hearing) and has 6 levels of tone controls (the most tone settings out of all the phones) so you can set the phone to match your type of hearing loss. Not only that but the phone is set up with accessibility in mind, from talking caller ID and keypad, to easy to use speed dial functions. Also, it comes with a feature called slow talk. This slows down the talker’s rate of speech so you will never struggle to understand what the person on the phone is saying to you. It is definitely the best phone for the hearing impaired available. And it’s our top pick. Buying tip: Watch the price on the Panasonic KX-TGM450S, if it’s under $120, it’s a GREAT deal. Our runner up for Best High-End Phone 2019 for the hearing impaired is the Clarity XLC 3.4. It’s still amplified to an impressive 50 db but unlike the Panasonic KX-TGM450S only has 4 tone settings. It has received more reviews than the Panasonic KX-TGM450S overall though and buyers are almost universally happy with their purchase. However, it does lacks the number of tone settings as well as a voicemail facility, so you would need to purchase additional kit and go through the hassle of setting it up if this is important to you. It also doesn’t have speed dial functions, so if you are buying this for a relative or a friend be mindful that they will either have to type their most frequent contact numbers in, or learn how to navigate the address book. Whereas the Panasonic KX-TGM450S has 3 big buttons on the base station that can be programmed to the person’s family and friends so they are always just a button touch away. The Panasonic KX-TG6592T is the best choice for a mid-range phone. Selected as ‘Amazon’s Choice’ for being both extremely highly rated and exceptionally well-priced, this phone features both an oversized keyboard and large ultra-clear displays on both the handset and base unit, which is perfect for those with less-than-perfect eyesight. While missing a few functions of some of the more expensive phones, it covers all the important bases such as amplification, tone settings, and ease-of-use and will be perfectly functional for most users. Most impressively for us is that this phone has a particularly impressive ‘Tone Equalizer’ function that accommodates hearing loss by allowing you to control the bass, mid-range or treble tones in a caller’s voice. This amazingly increases clarity even in situations when increasing the volume doesn’t help and is a surprisingly useful function. In addition, it includes a high-quality speaker phone, an integrated, easy-to-use answering machine, and can accommodate multiple handsets. Buying tip: Sometimes Amazon will heavily discount this unit – if this for less than $80, buy it! The Panasonic KX-TGM420 is the little brother of the KX-TGM450 and comes in as our Runner-Up for best mid-range phone. Across the majority of features, it is much the same as the more expensive model and they also look largely identical. However, the KX-TGM420 comes in at a slightly lower price, but is only amplified to 40 db. 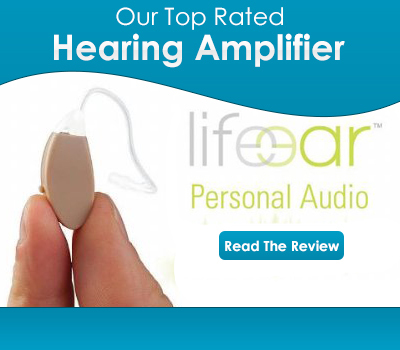 This makes it suitable for someone with mild to moderate hearing loss. If this is you, or someone you are buying for then there’s no reason why you should pay more for the extra 10 db of amplification. The only consideration to bear in mind is if your hearing loss deteriorates further then you may end up needing to upgrade to the KX-TGM450 in the future. If you don’t want to spend that much and don’t mind sacrificing slightly on the ease-of-use, accessibility, and some features of the more expensive phones, our highest-rated phone in the ‘Best Budget Phone 2019’ category is the Panasonic KX-TGE233B. This hugely popular phone offers a long range handset, great clarity, and some impressive noise reduction functions all for a very reasonable cost. Like the more expensive Panasonics it has oversized buttons and a large, crystal clear display for super-easy use. Like high-spec’d phones, it also features caller ID, call blocking, and a reasonably loud, clear speakerphone (though the quality of speaker in the more expensive KX-TGM450S for example we found was somewhat better). The significant number of features are easily navigable using the menus and on-screen shortcuts, making it a particularly easy phone to use. The documentation that comes with the phone is also easy to follow, and my 76-year old grandmother had no problems with the initial setup and use. Buying tip: If you see this for less than $60, it’s a GREAT buy! We decided on something a bit different for our Runner Up Best Budget Phone 2019 – the Hamilton CapTel 840i. It is a very clever phone – it works the same as any regular phone however includes a large easy-to-view screen that converts speech to text in realtime. If you can’t hear what someone says over the phone, simply read the captions. While it requires an internet connection, the captioning service itself is completely free and there are no monthly fees or service agreements so your monthly phone bill won’t change. No other special equipment is required. Captions are generated through voice recognition technology, provided by a live Communications Assistant, and the service is available nationwide, 24/7. 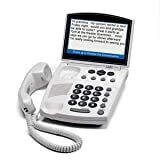 We found it easy to set up and use, and noted it also had several standard phone features for the hearing impaired, including good amplification, answering machine facility, and oversized buttons. We found the captioning function accurate and a breeze to use – very impressive technology, and for a great price! Designed specifically for individuals with difficulty hearing over the phone. REQUIRES Telephone Service and High Speed Internet Connection (Ethernet or WiFi). Captioned Telephone is easy to use. It works the same way you'd use any other telephone. If you can't hear what someone says over the phone, simply read the captions. Installing the captioned telephone is easy and installation support is available. Captions are available in English or Spanish. Internet Protocol Captioned Telephone Service (IP CTS) is regulated and funded by the Federal Communications Commission (FCC) and is designed exclusively for individuals with hearing loss. dB Amplification – This specifies the loudness of the amplification in decibels. 40 dB is suitable for people with mild to moderate hearing loss whereas 50 dB is suitable for people with mild to severe hearing loss. Both the clarity XLC 3.4 and the KX-TGM450 will be suitable for all types of hearing loss. Amplified microphone – This is a really useful feature, included with all our reviewed phones, which amplifies the voice of the person speaking. So if you have a weak voice, or speak quietly as well as have hearing loss then the person on the other end of the phone will hear an amplified version of your voice so they won’t miss anything you say. Amplified speaker phone – All 3 phones in our “best of” come with an amplified speaker phone. This means the person doesn’t need to have the phone up to their ear to hear the conversation. This is especially useful if the person using the phone is frail and finds it difficult to it up to their ear for the duration of the conversation. Talking caller ID – Designed with accessibility in mind, this feature will speak the caller ID over the speaker phone, alerting you to who is calling without needing to look at the display. If the number is in the phone book it will speak their name. Talking keypad – All 3 phones come with large backlight buttons, making it easy for people with sight problems to see what buttons they are pressing. But to aid in dialling, the phone will also talk back the numbers as they are dialled. Loud ringer – All 3 phones will ring loudly. Alerting you to the fact that the phone is ringing even if you are in another room. Flashing ring – All 3 phones will also light up and flash when the phone is ringing – further alerting you to an incoming call. Hearing aid compatible – If you’re using hearing aids then they are also compatible with all 3 of our recommended phones. This means you don’t need to constantly take out your hearing aid when answering calls. Expand with other handsets – If you want to have phones in different locations around your house then you will need to be able to buy add-on phones to complement your main phone. All 3 phones can be expanded with additional handsets. Number of tone settings – The tone setting adjust. different frequencies in the amplification. The more tone settings you have, the greater your ability to customise the amplification to fit your type of hearing loss. Answering machine – An answering machine is a useful feature, especially if you want your loved ones to be able to leave messages if you are not there. Unfortunately, the Clarity XLC 3.4 does not come with an answering machine so you will need to buy separate kit in order to set this up. Both Panasonic phones come with a built in answering machine facility with up to 17 minutes of recording space. Slow talk – this feature is only available on the Panasonic phones. It is activated by pushing a button on the handset. Once pressed, the phone will automatically slow the call down so you can clearly hear what the person on the other end of the phone is saying. Speed dial – Being able to speed dial is a really useful feature for seniors who want to easily reach their family or other commonly called people. Without this feature, you will have to manually type this number in, or in the case of the Clarity XLC 3.4, scroll through the phone book to find the number you want to call. 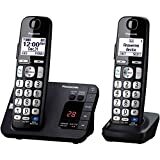 With the Panasonic phones, you have the ability to program 3-speed dial numbers which can be dialled by pressing one of the 3 buttons on the base station. Overall, after carefully considering features, price, ease-of-use, and effectiveness, we have decided that the Panasonic KX-TGM450S is the overall best phone for the hearing impaired in 2019 (see above for our review). It has all the technical specifications needed to make this a great phone for anyone with hard of hearing. The 50 dB amplification and 6 tone settings means it’s suited for all ranges of hearing loss, from mild to severe. Not only that, the design of the phone makes it incredibly easy to use even for novices. The voicemail function comes in handy and the slow talk functionality makes this phone really stand out. While it is a bit more expensive than some of the other phones, it has a huge number of very useful functions that justify paying a bit more. We highly recommend this phone. Our runner-up for best phone for the hearing impaired 2019 is the Panasonic KX-TG6592T (see above for our review). This is an extremely capable phone at an amazingly good price, that in all honesty has 80%+ of the functions and capabilities of the more expensive KX-TGM450S. If you want a great phone but at a more affordable price, this is our pick for 2019. How do feel about this regarding the content of this article today? How does the 880 and the 2400 compare to the 840 from customer and your review? I like to enquire if there is a simple phone for deaf or hard of hearing? My grandmother came from china and isn’t equipped for such complex phones. I am looking for a simple phone that she can use. Are any of these phones available in Johannesburg South Africa? Is there ring volume adjustable . Can it be set to ring longer before answering achine picks up.. is the volume adjustable for incoming calls. These questions are for the Panasonic KX-TG6592T. Which of the recommended phones are also considered speaker phones ? if not, what would you suggest ? power outages. I will only consider amplified phones that connect to phone lines via phone jacks! why are you neglecting reviewing corded amplified phones?!! 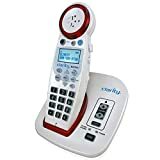 Good day i am interested in purchasing a cordless telephone with a built in telecoil but i need to know if it will work with my sivantos primax px5 hearing aids. Will I be able to use the Panasonic KX-TGM420W in Johannesburg South Africa, please let me know before I purchase. Also let me know the delivery eta. Can this phone be used away from home to go shopping or to a restaruant? Does the panasonic phone have Bluetooth comparability to use with hearing aids? 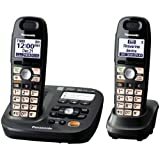 does the panasonic telephone have Bluetooth compatibility with hearing aids? Can the Panasonic kx-tgm450s priced $159.95 be installed on the wall? I am looking into a purchase of a Hearing Impaired phone. Are there any senior discounts available now. Was if any is the warranty include. What is the best phone for those who wish to see a text of what the speaker has to say, much like closed captions on TV? What is the T (for telecoil) rating on these telephones? I, literally, have tried EVERY amplified phone on the market! Reizen makes an ‘outstanding’ amplified phone, but unfortunately, does not make an Answering machine. (BIG miss on their part!) ‘Amplicom also has great amplification & I have owned two of those. Sadly, they mechanically fail too often, too easily & ‘Customer Service’ is non existent! I have also owned Clarity & Panasonic & find their ‘clarity’ deplorable, even though they are featured in excess by retailers as being exceptional. I disagree, based on personal EXPERIENCE! In fact, I own one right now & have to re-play & re-play messages to actually understand what is being said! I would pay any price if only Reizen would make a phone with Answering system or a Cordless phone! 97 year old mother needs amplified phone with mobile attachments so she can have one in bedroom and bathroom in addition to the main phone. Any suggestions? I own a small business and I am hard of hearing. I am looking for a wired desk phone (one line) with good quality volume control What do you suggest? Does the Panasonic KX-TGM450s have BlueTooth compatibility ??? If not, do you know of other hard of hearing phones with Bluetooth ?? Hi, I do want to find the best phone for my hearing loss. I wonder whether you tested others, eg the Oricom PRO 910, or the Uniden SSE47+1. Can you reply to me by email lease. I am looking for a 3 line phone (land line), for the hearing impaired. This is for my wife’s business. Is theer anything out there that is available? I wear hearing aids, but having great difficulty at work in hearing clearly on the phone. My job entails answering the phone, which is in effect a switchboard as I am able to transfer calls, but otherwise looks like a standard phone. Can these phones mentioned to improve quality of sound be plugged in and work in place of the phone that is currently used in the office?